This is the second of three posts dedicated to the Fourth Annual Barrymore Blogathon being held over at In The Good Old Days of Hollywood. Tnx Crystal for letting me take part! Brief Synopsis – Political intrigue occurs when Former US President sends an envoy to the Texan government in order to convince them to join the Union. My Take on it – This is a film that I had never heard of before trying to find a film starring Lionel Barrymore to watch and review for this blogathon. This was actually Barrymore’s final film and I’m quite glad I chose it because it is done quite well. This film has a great premise and it is able to mix numerous genres together to give us a very interesting story. They manage to combine a western with both political and historical significance while keeping the action level quite high. The cast is great and besides Barrymore, we get Clark Gable, Ava Gardner and Broderick Crawford giving stellar performances. This story is based on the premise that the events are based on truth, and I must admit that I’m sure parts were changed in order to make it more interesting, but nevertheless they do manage to tell quite an important episode in history and find a way t keep things interesting the entire time. Bottom Line – Great premise because it’s action packed, politically motivated and manages to also be a history lesson. This story is the kind I usually enjoy and they present it in a great way. 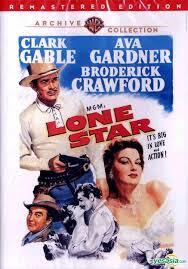 The cast is great with Gable, Crawford, Gardner and Barrymore all giving stellar performances. Not sure how much of this story is true, but they manage to keep things quite interesting the entire time. Recommended!